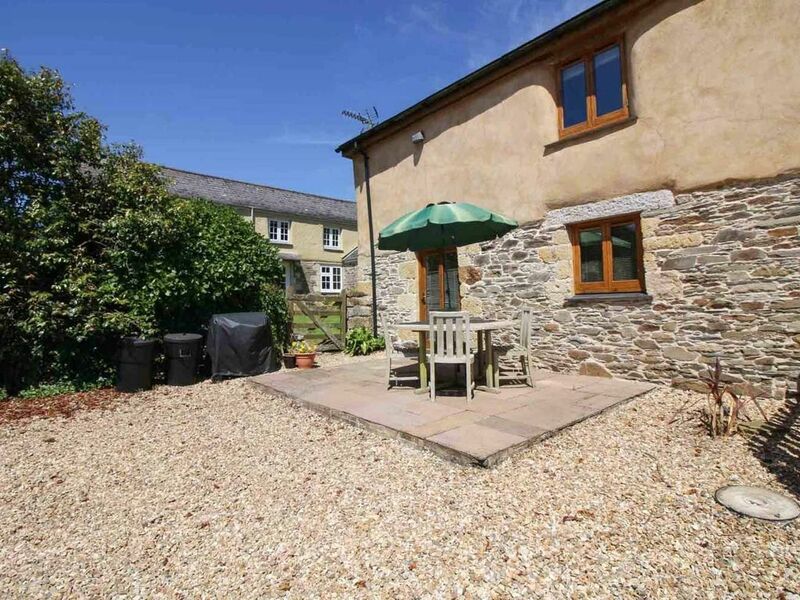 Little Carwinnick is a beautifully converted barn and is superbly presented by the owners. It is a truly superb place to stay, being centrally heated and double glazed, yet retaining its undoubted character, with oak timber floors and exposed stonework, a newly fitted kitchen and bathroom. Located in a peaceful, yet extremely convenient location at the north end of the Roseland Peninsula. Carwinnick is superbly positioned for those wanting to visit the Lost Gardens of Heligan or the Eden Project, both of which are less than 20 minutes drive away. The barn benefits from a sizeable living space with comfortable sofas, a flat screen TV and a fully fitted modern kitchen. There is access onto the patio area with its tables and chairs, ideal for al fresco dining. The property stands in gardens and grounds extending to around 2 acres. The majority is grassed, making it an ideal area for children to play and explore. There is a small copse where bluebells flower in the spring. In addition the Owners have set over 3,000 daffodil bulbs since the development was completed! The former enclosed farmyard is a wonderful sun trap and catches the setting sun and is laid out with limestone paved patios to provide both sitting and outside eating areas, weather permitting. Ground Floor: Double bedroom, twin bedroom, family bathroom with over bath shower. First Floor: Fully fitted kitchen, lounge and dining area. Exterior: Patio with external furniture and BBQ facilities. Heating is via oil fired heating throughout. The kitchen is equipped with an electric oven & hob, fridge / freezer, dishwasher, microwave & washing machine. The lounge has a large TV with DVD Player. There is WiFi available at this property. Electricity, heating, bed linen and towels are all included but you will need to provide your own beach towels. There is plenty of parking available for vehicles. Regrettably no dogs are allowed. We regret no smoking is permitted. &pound;100 pre-authorised to your credit or debit card as a security deposit is required. What a great holiday let. It is the most relaxing holiday that my wife and I have had. Nigel and Pam were brilliant. The cottage provides everything you need for your holidays in Cornwall. It is a perfect getaway to see all the interesting spots in middle and south Cornwall. A nice little terrace with a set of garden furniture gives you the opportunity to enjoy some time near the cottage as well. Our hosts Nigel and Pam have been very welcoming, we got a welcome package by mail right after our booking and even have received some messages via cellular phone closer to our arrival with very helpful information like how to get to the cottage. We can recommend this cottage to every party of up to 4 people without any reservations. The cottage was very comfortable and the owners were very welcoming. We appreciated the automatic heating system as we were unlucky enough to have a day of gales and horizontal rain. Excellent location for the Eden Project and Gardens of Heligan and also within easy distance of the Roseland and the North coast beaches. Highly recommended - the best we've stayed in! Little Carwinnick is slightly off the beaten track, but not by much! The location is quiet but very well-placed for conveniently-accessing the best bits (town and country) of Cornwall. We were met by the owners, who showed us around the cottage/barn and gave helpful information to help ensure an enjoyable stay. The accommodation was clean, bright and well-furnished; modern washing machine, dishwasher and fridge were included. It was a pleasant surprise to find that cleaning materials (and washing-up, dishwasher and washing machine detergent) had been provided by the owners. Crisp bedlinen, loads of hot water, all very pleasant indeed. We enjoyed a week of dry, sunny weather and even managed a few glasses of wine on the patio at sunset. We hope to visit again. The village of Tregony (3.5 miles away) in Cornwall is often referrred to as the 'gateway to the Roseland'. The exceptionally wide Fore Street is a relic from the days when this was a busy port and market town with considerable traffic. The port has long since silted up due in part to china clay workings up stream, but Tregony has retained its charm. Tregony has an unusual clock tower on Fore Street and the seventeenth century almshouses which boast an unusual wooden gallery. The site of a twelfth century Norman castle known as &lsquo;Treg-ney' from which the village got its name is situated on Tregony Hill. Tregony has a good local convenience store, plus a Post Office and good village pub in the Kings Arms. For really good food, we recommend the Kings Head at Ruan Lanihorne, only a short drive away. The city of Truro (10 miles away) with it's great shopping including a Tesco, Sainsburys & Marks & Spencers, is within a 15 minute drive of Tregony. St Austell (5 miles away) was once the major producer of the worlds China Clay, now with cheaper foreign imports the industry is in decline but The Wheal Martyn China Clay Museum set in two former working pits depicts the countryside in years gone by. Wet weather activities could include the visitor centre at St Austell Brewery, sampling beers and ales made on the premises. The brewery has recently started exporting their products across the Tamar River to England, so you may just find where your favourite brew is made. With large attractions such as the Eden Project on the outskirts of St Austell, The Lost Gardens of Heligan a 20 minute drive towards Mevagissey, and Charlestown mere minutes away it provides an ideal base for your travels. The coastal town of Fowey is a simple 20 minutes drive past the China Clay port of Par, offering fabulous restaurants, galleries and gift shops. A short car ferry across the river takes you on to Polruan. Daphne du Maurier spent her later years in properties in and around Fowey, a festival of her works takes place each May. Electricity, heating, linen and towels are all included. Discounts available for couples staying for 7 nights outside the peak season, using one room only.